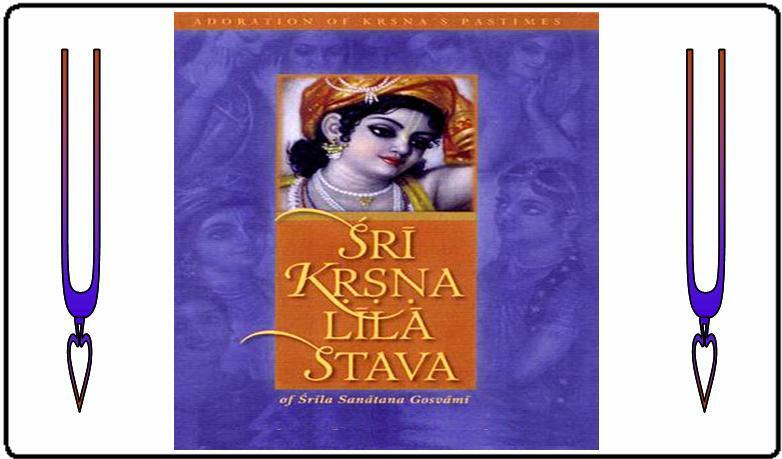 Krsna Lila Stava, or “The Prayers of Krsna’s Pastimes”, is one of the rare Gaudiya Vaisnava classics. The Krsna Lila Stava is a general skim through the Srimad Bhagavatam, focusing on Canto 10 Chapters 1 through 45, which deals with Krsna’s childhood lila. There are 432 verses in this book, divided into one-hundred eight sections called “obeisances (namaḥ).” Each obeisance is essentially a prayer to a particular lila or a particular chapter from the Srimad Bhagavatam. Before starting Krsna lila, Sanatana Goswami offers his first nine obeisances to the Lord, His devotees, and His previous incarnation, keeping the spirit of the Bhagavatam. After offering his final obeisance for Srimad Bhagavatam topics in Obeisance 102, he beings to sing glories of Lord Jagannatha and Lord Caitanya from Obeisances 103 to 107. The final two obeisances are closing prayers to Krsna. Whether it is for devotees who haven’t read the Bhagavatam or devotees who need bhajans pertaining to particular lila, Krsna Lila Stava is the most ideal text.